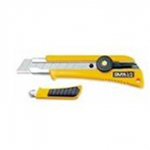 Genuine OLFA L-2 Model cutter for use with heavy duty 18mm snap-off replacement blades. The L-2 model has an anti-slip rubber grip. We also stock spare LB-10 blades which are compatible with this product.